You can proceed from any empty square to any empty square next to it (same rank, next or preceding file; or same file, next or preceding rank). You can proceed from any empty square to any empty square diagonally next to it (next or preceding rank, next or preceding file), provided that the catty-corner squares contain either (a) two pawns or (b) pawns/pieces of opposite color. (Two non-pawn pieces, or a non-pawn piece and a pawn, of the same color are strong enough to bar your progress across the corner, but two pawns are not; and pieces/pawns of opposite color don't work in concert to bar your way.) For example, if you're on c4 and d5 is empty, you can proceed to it provided c5 and d4 contain pawns or contain pieces/pawns of opposite color. See the "Example diagonals" section, below, for pictures. FEN's board description. 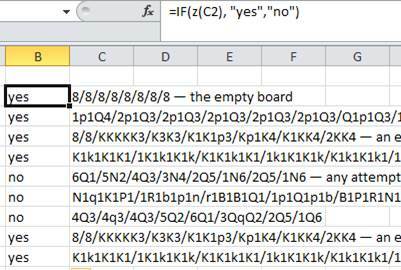 That is: The input will be a string that includes a description of rank 8, a slash (/), a description of rank 7, a slash, …, and a description of rank 1. The description of each rank comprises numbers and letters running from file a to file h, where the letters indicate pieces and pawns (the black ones are p= pawn, n=knight, b=bishop, r=rook, q=queen, k=king, and the white ones are capitalized versions of the same) and the numbers indicate the successive number of empty squares. For example, rnbqkbnr/pppppppp/8/8/4P3/8/PPPP1PPP/RNBQKBN is the board after one ply move (king's pawn to e4) in a chess game. a1 and h8 will be empty in the input; i.e., the first slash has a digit before it, and the last slash has a digit after it. Truthy or falsey, indicating whether successful passage to h8 is possible. This is code golf: fewest bytes wins. Note that your code must work for all valid inputs, not only the examples. N1q1K1P1/1R1b1p1n/r1B1B1Q1/1p1Q1p1b/B1P1R1N1/1B1P1Q1R/k1k1K1q1/1K1R1P1r — the only way through the a8-h1 diagonal is at f2-g3, but that would require passage through e1-d2 or f2-e3, which are both impossible. In case the prose above was unclear, here are some pictures. Reading the input string occupies up to 'Wend'. Nice side effect - this abandons the input string once the board [X] is fully coded, so you can leave a description on the end. In the board coding, pawns are 2, other pieces are 3, black is negative. Pawns are recognized by 'P' & 'p' having character codes divisible by 8. 'X(7,0)=1', setting a1 accessible, is where the path checks start. This repeatedly scans the board trying to add accessible squares from squares marked as accessible (1) so far. Diagonal access and occupancy are checked in a IF + logic-calc which once lived in a function but now sits in nested neighbour loops. The diagonal access check relies on the product of the two kitty-corner squares, which is only at 6 or more if pieces there are the same colour and at least one is a piece not a pawn. Edit1: The code is now not as 666-devilish :-D and has lost its functions; I found a short-enough way to write them to avoid the overhead. The coding of pieces & squares changed. No effect on code length. Edit3: Return of (fake) functions, removing all those annoying Call bytes, and some other tweaks. Edit4: Breaking through the big 500, woohoo - smooshed the 3 For loops into 1. 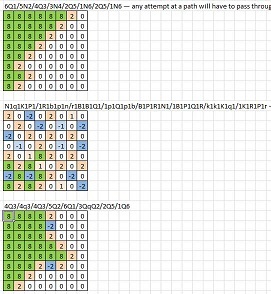 For interest, graphics of the boards after accessibility analysis (the code numbers are out of date but...) accessible squares are green, inaccessible squares white and other colours are pieces or pawns. This solution is not very golfed, but I wanted to go ahead and put it up. 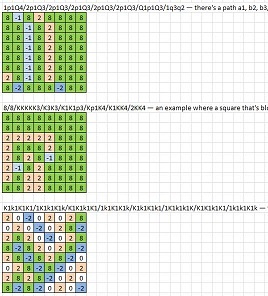 Reads a board string x as specified above and turns it into the more completely represented o, then finds all the moves (graph edges) between spaces, then figures out which moves are possible (not into filled spaces), then figures out which possible moves have "gates" of two pieces to pass between, then figures out if the gate is open (pawns, opposite colors) or closed (same color and including a non-pawn). Then, it walks through to find locations reachable by paths from the lower left square and if a path can reach space 64, it's a Yes board. Not the answer you're looking for? Browse other questions tagged code-golf chess maze or ask your own question.